The excellent Nissan GT-R Nismo is available for £150,000. The impressive Nissan GT-R Nismo is the firm’s range topper and will be priced at £150,000 when it goes on sale in the UK next month. The super coupe is being launched across Europe with a 3.8 litre twin turbocharged V6 engine producing 600 PS – that’s around 30 PS better than any other GT-R.
Nissan says the new GT-R Nismo offers a high performance race car designed for the road and utilises the coupe’s legendary sporting heritage boosted with state-of-the-art technology and design improvements. Along with the standard Nissan GT-R, the Nismo has had a revamp with a dramatic new bumper but this is made from carbon fibre (unlike the standard model) to help reduce weight and help cool the car’s engine so the V-motion grille will collect more air to help cool the engine. Indeed, the designers ensure that the Nissan GT-R Nismo’s redesign boosts airflow around the vehicle to help generate enough downforce to deliver exceptional levels of performance and dynamics. The firm says the car develops more downforce than any other car they have ever made before which bring stability when travelling at high speed. The all-wheel drive Nissan GT-R Nismo also comes with reinforced body structure and better springs, stabilisers and shock absorbers which also help improve capabilities. Owners of the Nissan GT-R Nismo will soon find that the car has improved slalom times and its cornering performance has also been boosted when compared with the previous versions and there is better balance overall which means it is a joy to drive around a circuit as well as on winding country roads. There’s also a redesigned dashboard, a new steering wheel and unique leather covered Recaro bucket seats for the Nismo. While the GT-R Nismo comes with a hefty price tag there’s a lot recommend a car that will deliver exceptional supercar levels of performance and it’s going to be a popular choice for those who want to impress on track days, for instance. 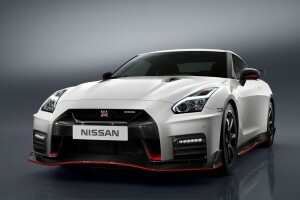 This entry was posted in Car Leasing, Cars, Performance Car, Sports Car and tagged Nissan GT-R Nismo by Steve Lumley. Bookmark the permalink.